StackCompare is a tool that lets you see how you're doing on StackExchange sites relative to other people, be they friends, rivals, or some combination. Track your and their reputation over time. Compare badges held. Watch as you overtake them in the ranking list. StackCompare is currently closed-source, but the app is free-to-use, with no plans to change this. Head over to the StackCompare site and start adding friends; graph their progress against yours and use the detailed comparison tool to see how you measure up. StackCompare should work on all modern major browsers; it was developed in Google Chrome, and while it doesn't look great with Lynx, it should still be usable. 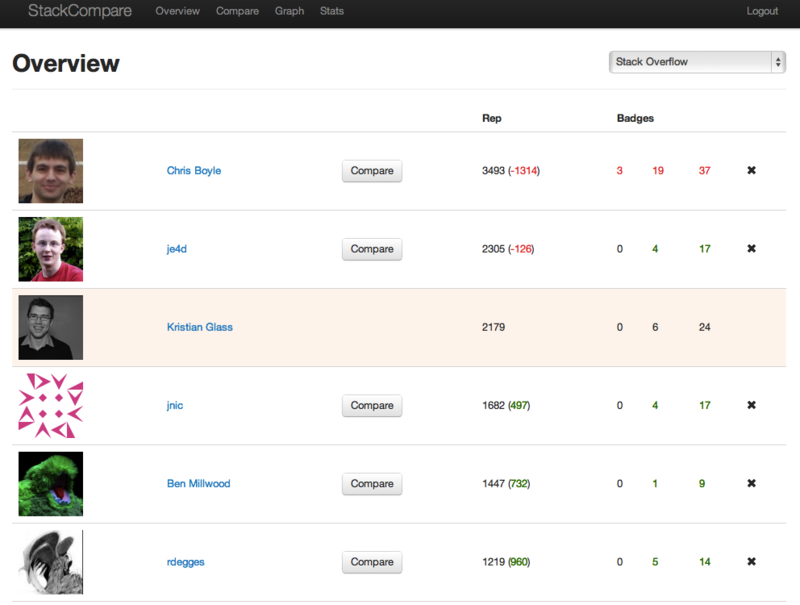 StackCompare is a Moorhen Solutions Ltd. production, written by Kristian Glass - find him on Twitter as @doismellburning.